Adsaro Popunder, Popup, Direct links advertising network details. Adsaro is a leader of pop-under ads that ensure quality traffic for their customers. Adsaro provides affiliate programs in order to earn revenues by promoting them. 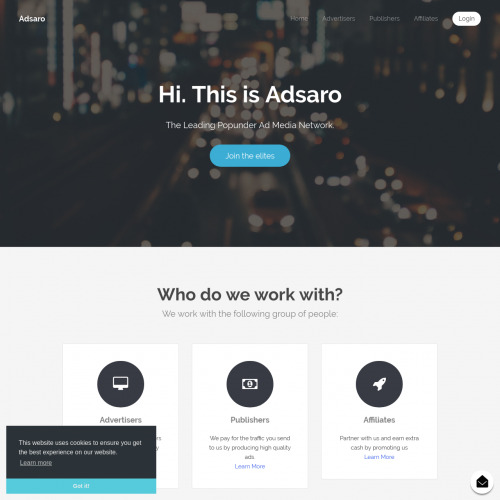 Advertisers that use Adsaro get to promote their websites using global audiences. This platform promotes all sorts of verticals like games, finance, e-commerce, media, adult, travel and many more. Adsaro uses the latest targeting tools and engines in order to select customers according to their browsers, operating systems, devices or country. If you have any questions before registering in the Adsaro Network, reach the Information section for additional details. Once you create an account, you will get a dedicated Manager to help you reach your desired revenues with Adsaro. Wow! Provides high quality real traffic and also high conversion ratio.